The report covers the analysis and forecast of the automotive stamped components market on global as well as regional level. The study provides historic data of 2016 along with the forecast for the period between 2016 and 2025 based on revenue (US$ Mn). 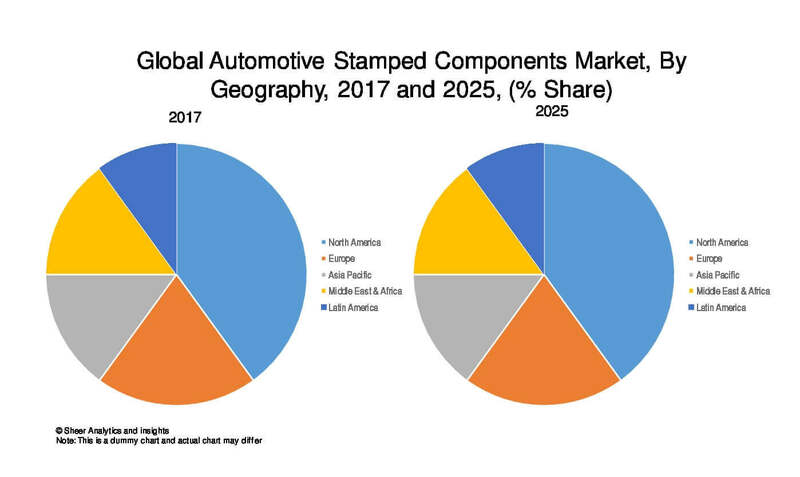 The study provides a detailed view of the automotive stamped components market, by segmenting it based on type, by vehicle, by material and regional demand. The stamping or either can be named as pressing is the procedure where a flat metal sheet is placed into a stamping press where the metal is formed into the desired shape. This stamping process is adopted in many manufacturing field that helps in performing of hardened surfaces such as plastic components and sheet metal. Automotive stamping components market has been on a growing stage throughout the forecast period. In the past few years, the rise in demand of automobiles has a positive impact on automotive stamping market thus augmenting the growth of this market. In the automotive sector, the rise in use of stamping machines has credited the growth of automotive stamped parts and hence it is assumed to grow at a very fast rate during the forecast period of 2016-2025. Regional segmentation includes the current and forecast demand for North America, Europe, Asia Pacific, and rest of the world. The segmentation is also done by type, by vehicle, and by material type. The competitive profiling of the key players in the global automotive stamped components market across five broad geographic regions is included in the study. These include different business strategies adopted by the leading players and their recent developments, as in the field of automotive sector. A comprehensive analysis of the market dynamics that is inclusive of market drivers, restraints, and opportunities is part of the report. Additionally, the report includes potential opportunities in the automotive stamped components market at the global and regional levels. Market dynamics are the factors which impact the market growth, so their analysis helps understand the ongoing trends of the global market. Therefore, the report provides the forecast of the global market for the period from 2014 to 2025, along with offering an inclusive study of the automotive stamped components market. The report provides the size of the automotive stamped components market from 2016 and the forecast for the next nine years up to 2025. The size of the global automotive stamped components is provided in terms of revenue. Market revenue is defined in US$ Mn. The market dynamics prevalent in North America, Europe, Middle East and Africa, and Asia Pacific have been taken into account in estimating the growth of the global market. The Market estimates for this study have been based on revenue being derived through regional pricing trends. Demand for automotive stamped components has been derived by analyzing the global and regional demand for automotive stamped components in each application for its respective functions. The automotive stamped components market has been analyzed based on expected demand. We have used the bottom-up approach to estimate the global revenue of the automotive stamped components market, split into regions. Based on by type, by vehicle type, and by material type we have summed up the individual revenues from all the regions to achieve the global revenue for automotive stamped components. Various Companies were considered for the market share analysis, based on their innovation and application and revenue generation. In the absence of specific data related to the sales of automotive stamped components several privately held companies, calculated assumptions have been made in view of the company’s penetration and regional presence across all applications. The report covers a detailed competitive outlook that includes the market share and company profiles of key players operating in the global market. Key players profiled in the report include Gestamp, Orchid International, Santec Group, Schuler Group, Hyundai Rotem, Eagle Press & Equipment Co. Ltd, AIDA Global among others. Automotive stamping or pressing is the procedure where a flat metal sheet is placed into a stamping press to form the metal is into its desired shape. This stamping process is adopted in many manufacturing field that helps in performing of hardened surfaces such as plastic components and sheet metal. Several operations such as bending, embossing, blanking, coining, drawing, curling, ironing, hemming and others can be done with the aid of stamping machine. Automotive stamping components market has been growing steadily throughout the forecast period. In automotive industry the stamping process is the bedrock of all building process as most of the components needed to build up a vehicle are originated by the stamping process. Moreover, the rise in demand for automobiles has increased in the past couple of years which in turn leads to an increasing demand of the stamping process in the automotive sector. Further down, the rise in use of stamping machines has credited the growth of automotive stamped parts and hence it is assumed to grow at a very fast rate during the forecast period of 2016-2025. Automotive stamping components offer wide range of benefits in the automotive sector. These benefits may include lower wastage of material, the process is much faster than any other operation, has very high accuracy and the process is much more versatile and flexible which results to lower the cost of manufacturing. In an automotive industry, copper stamping is the most common of process as copper has good ductility and corrosion resistance properties. The use of copper stamping process is done to manufacture engine radiators and other fuel components. Further down stainless steel stamping is also done by automobile manufacturers as they are used to construct tubing systems, brackets and sensors. Thus automotive stamped components are likely expected to boost the market growth during the forecast period. The automotive stamped components market in report is segmented by type which is further categorized into two different parts such as BIW (Body in White) and Chassis. Further down, the report has been further segmented by material type which includes traditional steel, hot-formed steel, aluminum, magnesium, and composite materials. Additionally, the report has also been segmented by vehicle type which includes passenger cars and commercial vehicles. The global automotive stamped components market has been moreover segmented geographically into North America, Europe, Asia-Pacific, and rest of the world. Automotive stamped components system is a new kind of technology which is expected to grow at a high rate with the increase in production of automobiles across the globe. This process leads to lower labor requirements due to involvement of automation process with the aid of computers. Additionally, this process leads to lower material wastage and the production cost is very low. This stamping process can replace other metal working activities such as die casting and forging. Hence, the rise in demand in the manufacturing network, stamping technology can increase the demand for automotive stamped components market. Some of the major players in the automotive stamped components market are include Gestamp, Orchid International, Santec Group, Schuler Group, Hyundai Rotem, Eagle Press & Equipment Co. Ltd, AIDA Global among others. 10.6 EAGLE PRESS EQUIPMENT CO. LTD.